Researchers Kim and Le-Yin investigated the economic develop of the province of Qingdao, Northern China, to determine how foreign direct investment clustering set up by local government helped to create an electronic industry renaissance (2008). Using the hub-and-spoke model of geography with the flagship-and-five partner’s model of strategic management offers an additional theoretical lens to spur economic activity. The key is to encourage the economic hub to drive and influence the global network versus being perpetually dependent on it. Direct investment in China has superseded most countries of the world and has consistently beaten the U.S. since 2002. Chinese leaders have set up economic zones in urban areas that are the center of economic activity. As the investments in internal businesses rises so does the exports of the nation. Electronics is one field in which the Chinese have exceeded expectations. There is a dependent and a developmental type structure. In a dependent type structure, foreign investors seek to limit information and attempt to seek gain from local resources and labor. In a developmental structure information is passed so that local firms can develop because the goal is to enhance local resources and labor. Profits can be realized in either method through extraction of resources or enhancing of resources for sustainable profits. Local producers should be pushing to influence the global networks by updating technology, communication, and effectiveness. This helps them avoid a dependent position and helps to drive the industry with new development and product releases. As the economic hub develops and begins to lead the market the global network, it will seek to capitalize off of local innovation to create a win-win situation. - Growth of industries that provide input into the system. - Development of local skilled labor. -The creation of infrastructure and dedicated resources. As the work processes become more embedded into new firms and labor an infrastructure is developed that encourages higher local economic growth. It is the shared aspects of gaining knowledge and economic advantages that encourages mutual growth. As this synergy rises the area begins to flower and develop on its own. An economic hub can be defined as, “socio- territorial entity which is characterized by the presence of both a community of people and a population of firms’ and he adds that ‘in the district, unlike in other environments . . . community and firms tend to merge” (Becattini, 1990, p. 38). 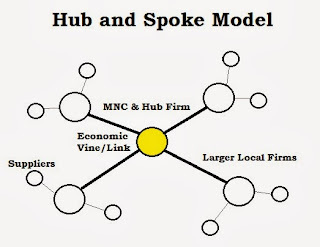 The hub and spoke model helps in mapping and understanding the structure of a local economic system. The model looks at regional anchors of business and industry and how suppliers and other related industries spread out like spokes on a bike (Markusen, 1996). Regional anchors can be seen as the cash cow type large businesses that appear to influence the economic market of the area. They can be connected to the natural resources of an area (i.e. mining, fishing, etc.) or non-resource based industries (i.e. cell phones, technology, etc.). A similar model also helps to describe the economic activity of an area. The flagship and five partner model indicates that a flagship firm (i.e. multi-national corporation) is vertically connected to and provides leadership to suppliers, customers, competitors, and other non-business infrastructure (Rugman and D’Cruze, 2000). The flagship is the dominating multinational firm (or large firm) that influences the development and direction of other firms in their economic vines. The researchers (Kim and Le-Yin, 2008) conducted interviews with companies around Qingdao to understand how these firms work together for mutual benefit. They delved into the various types of suppliers and products being sold. It was important for them to also look at how multinational firms and direct foreign investment can create higher growth within an area. They found that larger firms created a structure by integrating a number of firms and suppliers to work together. These large firms stepped into fragmented industries and connected them to produce significant benefits. As firms worked in research & development and updated their technology the transference of information led to higher levels of mutual growth. The larger firms were able to draw in more foreign direct investment into the area. The key is to have firms work together in a dynamic way creating higher levels of growth, exchange, and economic development. 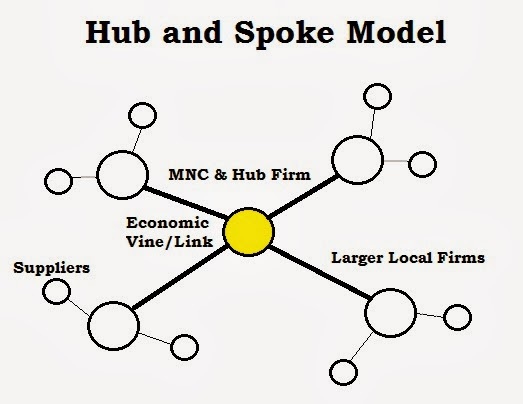 The report does highlight the ability to use the hub and spoke model as well as the flagship model to map an economic area. Previous research has indicated that synergy can be created among the varying firms in order to develop higher levels of growth. Furthermore, additional studies have indicated that cognitive models develop within the population based upon culture, skills, and social interaction that exists between the interlinking of these firms. It is these new cognitive models formulated among the bounded rationality of firms as well as the general population that can create perpetual growth upward. This growth and transference of knowledge can be fostered by flagship businesses that encourage interaction among firms by ensuring that a percentage of supplier capacity is open to working with other companies. Becattini, G. (1990) The Marshallian industrial districts as a socio-economic notion, in Pyke F., Becattini, G. and Sengenberger, W. (Eds) Industrial Districts and Inter-firm Co-operation in Italy, pp. 37–51, International Institute of Labour Studies, Geneva. Cumber, A. & Mackinnon, D. (2004) Introduction: clusters in urban and regional development, Urban Studies 41, 959–969. Kim, J. and Le-Yin, Z. (2008). Formation of foreign direct investment clustering-a new path to local economic development? The case of Qingdao. Regional Studies, 42 (2). Markusen, A. (1996) Sticky places in slippery spaces: a typology of industrial districts, Economic Geography 72, 293–313. Rugam, A. and D’Cruz, J. (2000) Multinationals as Flagship Firms: Regional Business Networks, Oxford University Press, Oxford.